As part of the 117th Jayanthi celebrations of His Holiness Sri Chandrasekharendra Sarswathi Mahaswamiji and the 75th Jayanthi of His Holiness Pujyasri Jayendra Saraswathi Sankaracharya Swamiji, an Ati Rudram and Sahasrachandi Mahayagam is being organized at Sri Kanchi Kamakshi Ambal Temple. 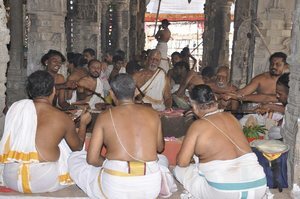 The Mahayagam commenced with Sri Mahaganapati Homa and Navagraha Homa on the 28th May 2010. On the 30th May, the Sankalpa for performance of Ati Rudram and Sahasra Chandi Homam was done in the divine presence of His Holiness Pujyasri Jayendra Saraswathi Sankaracharya Swamiji and His Holiness Pujyasri Sankara Vijayendra Saraswathi Sankaracharya Swamiji at the Vasantotsava Mandapam in the Temple. 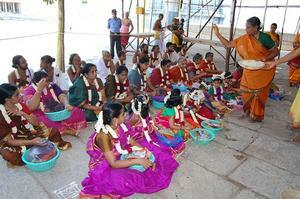 Advaita Math Peethadipathis from Karnataka and Andhra Pradesh are participating in the celebrations. In the morning Sri Rudra Japam – Homam and Sri Sahasra Chandi Japam- Homam is being performed. 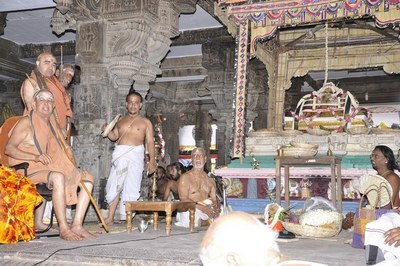 Veda Parayanam and various archanas are being performed in the evenings, followed by music concerts by leading artists. Detailed programme is given below. Following Advaita Math Peethadipathis from Karnataka and Andhra Pradesh will participate in the above celebrations and bless the function. Devotees are invited to take part in the above programme and receive the blessings of the Almighty and Pujyasri Acharya Swamijis.